This year’s DC Design House may be one of Washington, DC’s most dramatic before and after remodeling projects. 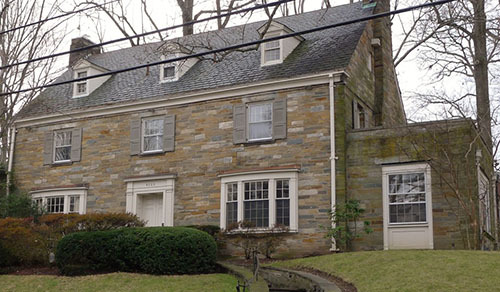 The location chosen for the 2014 DC Design House is a spacious, historic home located in Forest Hills. The 8,000-square-foot home was built in 1929 by Marshall B. Coyne, the founder of the Madison Hotel. Coyne’s home has remained in the family since, and currently belongs to his granddaughter Suzi Wilczynski. Twenty-four local designers have had the privilege to transform 29 spaces within the gorgeous home. These spaces include: six bedrooms, five full baths, two half baths, a formal library, a three-car garage, and a pool. The Washington, DC Design House event is a designer showcase for the DC Metro area, in which top area interior design professionals showcase their talents into a “flowing themed design home” to raise funds for charity. Though the event started in 2008 as a single charitable event, it has since become the region’s foremost annual residential design attraction, with over 55,000 visitors over the past six years. It is also a leading annual fundraiser event for the Children’s National Health system, having raised over $1 million since 2008. Case Design/Remodeling, Inc. and ibby are honored to contribute to the 2014 DC Design House. 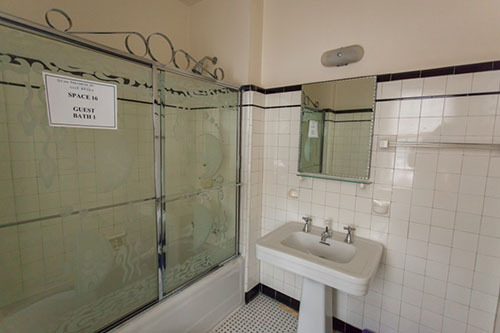 Notably, Case Design and Ibby were given the opportunity to remodel two of the bathrooms in the home. 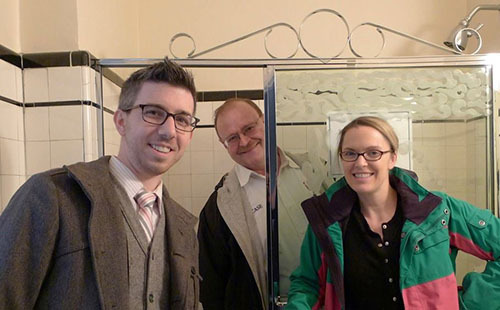 Members of the Case team in the bathroom. This marks the fourth consecutive year that Case Design’s Allie Mann has designed a space in the Design House. 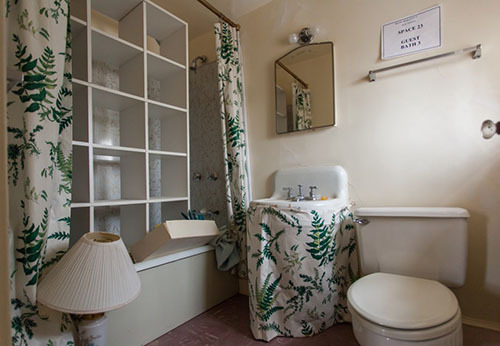 This year, Allie redesigned one of second floor bathrooms. Allie has an eye for creating comfortable and casual spaces, and her work has an emphasis on Kitchen and Bath design. 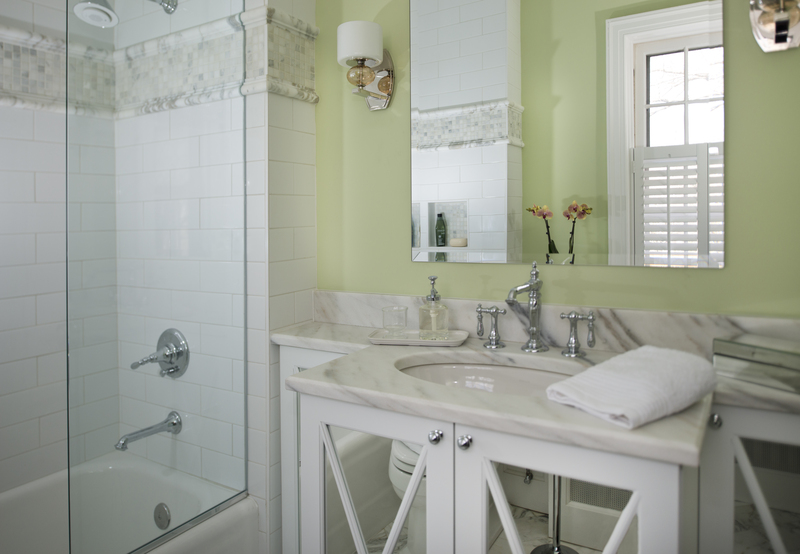 As you can see, Allie was able to transform an outdated, white-tiled bathroom into an elegant bathroom with calming moss green walls, polished marble floors and countertops, and stylish cabinets. TJ used ibby’s online design tool to map out the bathroom before making any changes. 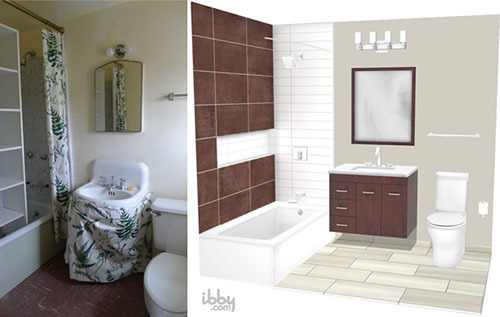 With the help of Team Ibby, TJ transformed the old bathroom into a modern space that still felt at home in a historic house. The dark wooden cabinets contrast nicely with the bright white walls, bathtub, and sink. 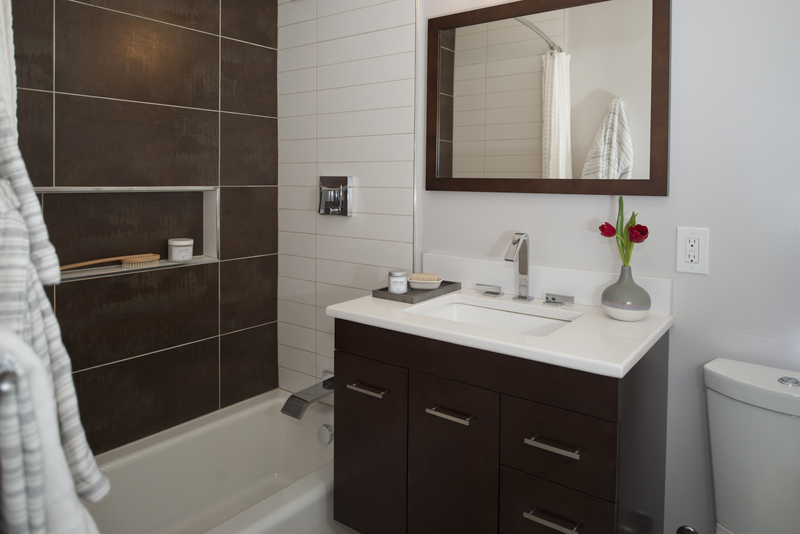 The clean, straight lines and rectangular shapes give the bathroom a sleek look. The 2014 DC Design House opens to the public on Sunday, April 13 and runs through Sunday, May 11. Hours are Saturday & Sunday from 12 – 5 pm, and Tuesday thru Friday from 10 am – 3 pm. Tickets cost $25 each and are available online or at the door. The home is located at 4600 Linnean Way, NW, Washington, DC. For more information, please visit the official website or Facebook page.